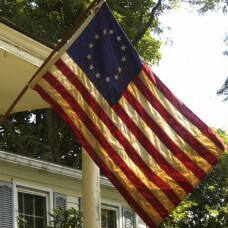 Shop for authentic replica Bonnie Blue flags. Our Bonnie Blue flags are constructed of durable nylon with a canvas heading and offered in five sizes. The Bonnie Blue Flag is the name given to the emblem of a part of what is now the southeastern United States of America. It is a striking design consisting of a single, white, five-pointed star on a deep blue background. Its origins are in the early 19th Century, when the USA was establishing its territorial boundaries. The single star refers to the newly formed Republic of West Florida, as a new star in the sky. The Republic of West Florida was a breakaway territory in what is now Alabama, Louisiana, and Mississippi. The Bonnie Blue was first flown in 1810. The Republic of West Florida was formed by English speaking inhabitants of parts of North America occupied by Spanish colonists. This included parts of Louisiana east of the Mississippi river. These residents united to overthrow the governor at the time, de Lassus, at Baton Rouge. After this victory over the Spanish, the Republic of West Florida lasted 74 days as an independent entity. It became part of the extended, contested Louisiana Purchase. This was a process in which Spain and the USA haggled over what consisted of the drainage of the Mississippi basin. The USA eventually gained purchase of West Florida, a significant point in its eviction of Spanish colonialists from North America. In 1836, the Republic of Texas annexed West Florida. From that time, the Bonnie Blue Flag had also become known as the Burnet Flag. David Gouverneur Burnet was a hugely influential figure in the formation of the Republic of Texas. This was a sovereign state within North America from 1836 to 1846. 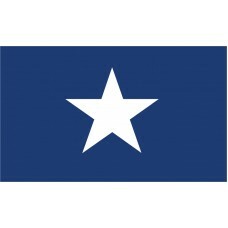 The single star design of the Bonnie Blue Flag still forms part of the modern Texan flag. Texas is known as the Lone Star State, and this is a result of its adoption of the Bonnie Blue Flag from the Republic of West Florida. The flag of Texas has a blue star on a blue background at its hoist side. The Republic of Texas was formally annexed by the USA in 1845. Its boundaries were the subject of disputes and armed conflicts. The Republic separated from Mexico at this point. The Bonnie Blue Flag not only represents a specific part of the USA, it is a symbol of Texan independence from Mexico. As such, it is a unique emblem in that part of North America. The flag was later used as a rallying point for soldiers and citizens during the American Civil War, or the War Between the States. Texas and several other states ceded from the Union in 1861, and the Bonnie Blue Flag was one of those flown at Fort Sumter by Confederate forces. The Bonnie Blue Flag is commemorated in arts and culture. There is an American folk song of the same name, and Rhett Butler's daughter in Gone with the Wind is named Bonnie Blue Butler. The name of the Bonnie Blue Flag resonates in the United States of America to this day.